With recent advances in software defined radio (SDR) it is in theory possible to track and listen into a payload using a sub £20 dongle and your PC. This is cutting edge and although suitable for testing and tracking the payloads of others it isn't recommended for actual tracking and recovery of your own payload. DVB-T dongles based on the Realtek RTL2832U can be used as a cheap SDR, since the chip allows transferring the raw I/Q samples to the host, which is officially used for DAB/DAB+/FM demodulation. The RTL2832U outputs 8-bit I/Q-samples, and the highest theoretically possible sample-rate is 3.2 MS/s, however, the highest sample-rate without lost samples that has been tested so far is 2.8 MS/s. The frequency range is highly dependent of the used tuner, dongles that use the Elonics E4000 offer the widest possible range (64 - 1700 MHz with a gap from approx. 1100 - 1250 MHz). WARNING : It is unlikely you will be able to use these devices for tracking a real flight unless you have a very good antenna. However for bench testing payloads they are more than adequate. For testing all that is really needed is a piece of wire 164mm (1/4 the wave length of a 434Mhz signal) pushed in the end of the dongle. A small 433/434Mhz stub antenna screwed in the end will also suffice. Neither of these will allow you to track real flights unless they are extremely close. Data sourced from http://sdr.osmocom.org/trac/wiki/rtl-sdr. The E4000 is hard to get hold of these days to the one you should be going for are R820T based boards. Some of the earlier boards lacked the anti static protection to allow the use of these with larger antennas. Warning. I don't know if mine is broken but its totally useless at receiving actual in the air HABs. Ok for testing but it drifts badly too. I would appreciate anyone else who has uses these giving some feed back thanks - Upu The NEWSKY TV28T RTL 2832U / R820T is a extremely cost effective unit that comes with an SMA adaptor. Older versions of TV Dongles do drift however more recent (2015) versions are much better and are used by many people for tracking. Dedicated dongles such as Airspy are now much more common and form the basis of very good receivers. 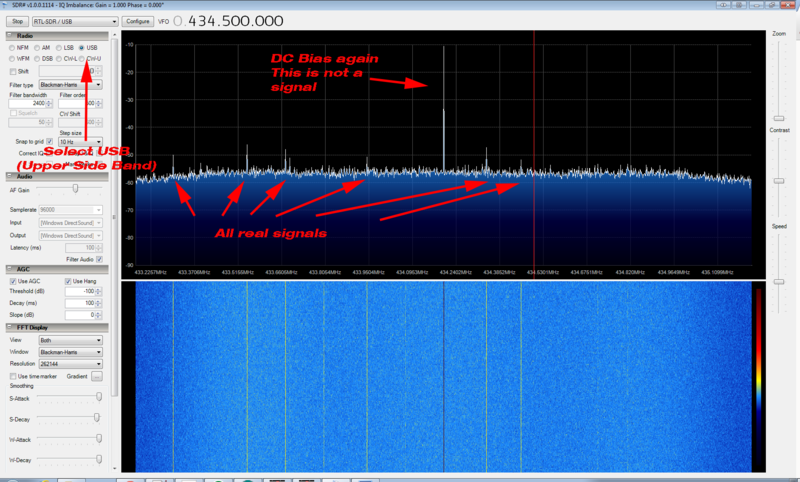 Gqrx SDR receiver has been successfully used with a the ezcap USB 2.0 DVB-T/DAB/FM dongle with good results. 1 x compatible dongle. Author has tested the ezcap USB 2.0 DVB-T/DAB/FM & a NEWSKY TV28T dongle with good results. Choose the one that says “Bulk-In Interface (Interface 0)”. In the box on the right of the green arrow ensure WinUSB is chosen. Check the USBID matches one of the devices in the list above. Click the button that says “Replace Driver”. If you have it selected correctly you will see something like the following. Each of those large peaks on the waterfall are commercial FM radio stations. Put your red cursor over one and click. You should be able to hear the station. 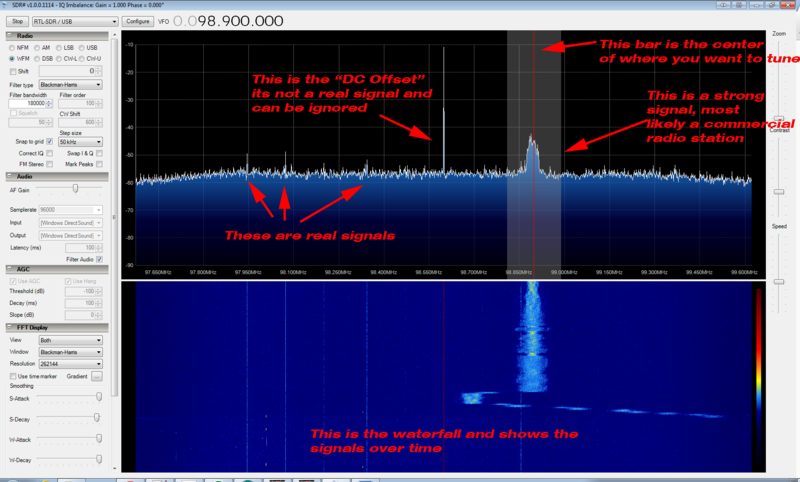 The big spike that's always present in the middle is the DC Offset and can be ignored. Due to the huge bandwidth of the dongles you can seem pretty much the whole frequency range the payloads operate on in one fell swoop, however sometimes this does make locating the payloads in all the noise difficult.Amend the VFO frequency of the dongle to 434,500,000 and the mode to USB. 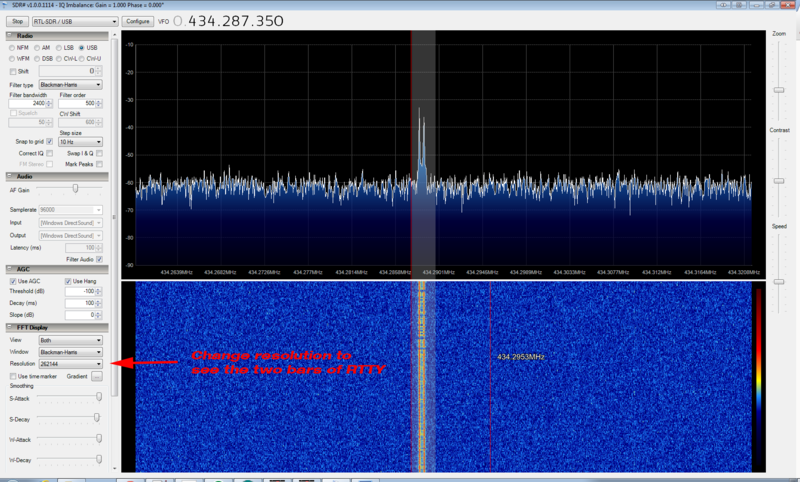 At this point you should be hearing the RTTY from your payload. You can zoom in / amend filter bandwidth to get it spot on the frequency. You can increase the resolution to make the waterfall and spectrum analyser less blocky. 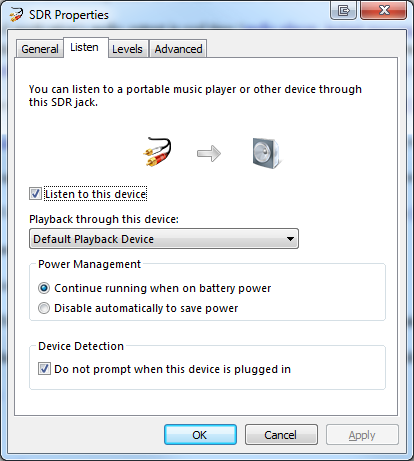 For the next step you will need to download and install Virtual Audio Cable or some other such software. If not, chose one of the below pieces of software. Virtual Audio Cable is available here : http://software.muzychenko.net/eng/vac.htm Virtual Audio Cable demo send some voice over the channel saying “TRIAL” so it's pretty useless now for this use. VB-CABLE Driver: http://vb-audio.pagesperso-orange.fr/Cable/index.htm, (21/08/18 Now moved to here: https://www.vb-audio.com/Cable/index.htm). VB-Cable driver is a donationware. The configuration steps are the same than VAC. You should try this one. Install it and just accept the defaults. Now go into Control Panel → Sound → Recording. Stop SDR# and under Audio select Output Line 1 (Virtual Audio Cable) Click start, you should now be able to hear the payload still. Installing the new driver will stop the EZCAP from being seen by the supplied radio/TV software. The quickest solution is to just plug it into a different USB socket when you want to use it for that, and re-insert in the original socket for tracking.